Kurt Busch was among the pack of drivers who turned laps on Monday during the Rookie Orientation Program at Indianapolis Motor Speedway. On the advice of team-owner Dale Coyne, road-racing specialist Carlos Huertas has adjusted to the idea of left turns only for the 98th edition of the Indianapolis 500 later this month. To that end, Huertas completed 77 laps around the 2.5-mile Indianapolis Motor Speedway Monday during the annual Rookie Orientation Program. Huertas was joined by fulltime Indy Car Series drivers Jack Hawksworth (Bryan Herta Autosport) and Mikhail Aleshin (Schmidt Peterson Motorsports) along with Martin Plowman (A.J. Foyt Racing) and 2013 Indy Lights champion Sage Karam (Dreyer & Reinbold Kingdom Racing). Huertas, who ran two seasons in Formula Renault 3.5 before originally testing with IndyCar’s Panther Racing, said a decision about competing in the series’ other five oval races will be made after the 500. The ROP is designed to provide first-year competitors an opportunity to get acquainted with their cars and the racetrack through three speed phases set by sanctioning body INDYCAR – 10 laps at 200-205 mph, 15 laps at 205-210 mph and 15 laps at 210-plus mph. Driver stewards also monitored car control, placement and a consistent driving pattern. Carlos Munoz, now an IndyCar Series regular with Andretti Autosport, capped his 2013 Month of May with a solid, second-place finish in “The Greatest Spectacle in Racing” to veteran Tony Kanaan. Munoz – ike Huertas a native of Bogota, Colombia – was a runaway choice as Rookie of the Year. “It was actually harder for me to go slower (in Phase 1) because you had to lift, and I don’t like to lift,” said Aleshin, the 26-year-old native of Moscow who is preparing for his first oval race in the No. 7 SPM Dallara/Honda. “This is so important and it’s all set now for working with the car in practice for the Indy 500. This will be the first oval race in my career and how awesome is it that it will be the Indy 500?” Aleshin, who finished 12th in Formula Renault 3.5 for Tech 1 Racing last year, logged 105 laps with a top speed of 219.170 mph. All but Karam, whose Chevrolet-powered Dallara developed a mechanical issue that prevented the 19-year-old from Nazareth, Pa., from finishing all three phases, completed the program. Per Indianapolis 500 rules, Karam will be allowed to finish the third phase on the first day of practice May 11. Hawksworth, a 23-year-old native of Bradford, England, completed 52 laps in the No. 98 Dallara/Honda with a top speed of 217.936 mph. Hawksworth scored three wins and finished fourth in Indy Lights points last year for team-owner Sam Schmidt. “For me, it was massively important to get in the car and dust off the cobwebs and get my feet on the floor,” said Plowman, driver of the No. 41 ABC Supply Dallara/Honda.”It’s been more than three years since I’ve driven a car in anger on an oval. Even though I’ve driven pace cars and two-seaters on ovals, it’s not the same. It was nice to remember all the experiences I had in Indy Lights and get a solid confident base in the car.” Plowman completed 90 laps with a top speed of 217.085 mph. Meanwhile, 1995 Indy 500 champion Jacques Villeneuve turned 83 refresher laps in the No. 5 Dallara/Honda with a top speed of 217.742 mph. Villeneuve, the popular former CART and Formula One World Driving Champion from Canada, was voted Indy 500 Rookie of the Year in 1994 after finishing second to Al Unser Jr.
Additionally, NASCAR Sprint Cup Series regular Kurt Busch, who completed his refresher course on the oval April 29 in an Andretti Autosport entry, recorded 180 laps and went through some rudimentary pit stops with the crew of the No. 26 Dallara/Honda. Busch topped the speed chart at 222.289 mph. 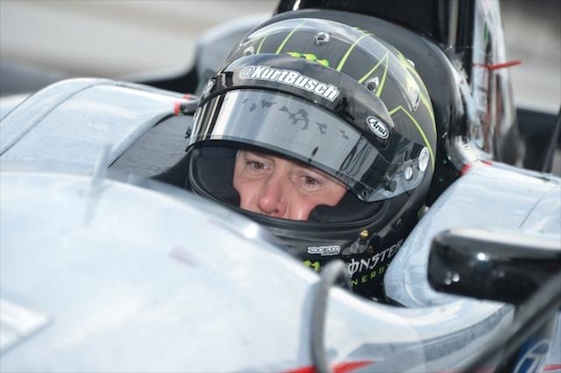 Busch, 35, will attempt to become the fourth driver to attempt “The Double” – competing in the Indianapolis 500 and the 600-mile Cup race at Charlotte Motor Speedway in Concord, N.C., on May 25. Busch won the latter event in 2010. John Andretti, Robby Gordon and Tony Stewart have run both races on the same day with Stewart – co-owner of Busch’s No. 41 Chevrolet SS at Stewart-Haas Racing – the first to complete all 1,100 miles in 2001. Cars and drivers will return to IMS for the opening of Indy 500 practice approximately 18 hours after the checkered flag flies for Saturday’s inaugural Grand Prix of Indianapolis on the reconfigured road-course. Indy 500 qualifications are booked for May 17-18.